H & J Smith Benchmark team mates are expected to go on the hunt for strong finishes at the fifth round of the Benchmark Homes Elite Cycling Series, the McKenzie & Willis Classic when it is raced near Queenstown on Saturday after spending much of the series racing overseas. Christchurch cyclist Tom Hubbard from the Homestyle Cycling team will face some strong challenges to retain his elite men’s lead during the event. Riders in the elite, masters and women’s races face a challenging 25 kilometre circuit in the Wakatipu Basin that features two key climbs that will prove decisive to the racing. The elite men will complete five laps for a distance of 129 kilometres while the master’s men and senior women will do four laps and cover 103 kilometres. Hubbard, who holds a slim series lead over Dunedin’s Joe Chapman (L & M Group Racing) and the previous rounds winner Sam Horgan (Benchmark Homes), has not raced on the circuit before but says he knows it’s quite tough. He also noted there are four riders lining up on Saturday who have recently returned from six months in Europe with the BikeNZ endurance track team, saying he expects Hamish Schreurs (Benchmark Homes), Invercargill based H & J Smith’s team mates Cameron Karwowski and Pieter Bulling and Dylan Kennett (Breads of Europe- All About Plumbing) to all go hunting for the round win as they don’t feature highly on the individual points table after being overseas for most of the series to date. “It’s going to be an exciting day, but we’re hoping to extend our lead to relieve some pressure heading into the final round; that will be our focus,” Hubbard said. Hubbard’s Homestyle team holds the Elite and Under 23 classifications leader’s jerseys as well as leading the team’s classification points table. Only seven points separates five riders at the top of the men’s masters points table with Brad McFarlane (Team Thule Cycling) and Kiwi Style Bike Tour’s Glen Rewi locked together at the top followed closely by Blair Stuthridge (Thule), Warmup Cycling’s Lee Johnstone, who missed the last round through injury and lost his lead in the series and Dunedin’s Mark Spessot (Cycle World). Experienced Timaru cyclist and World Masters record holder on the track for the individual pursuit, Reon Park (Team Calder Stewart) makes only his second appearance in the series. 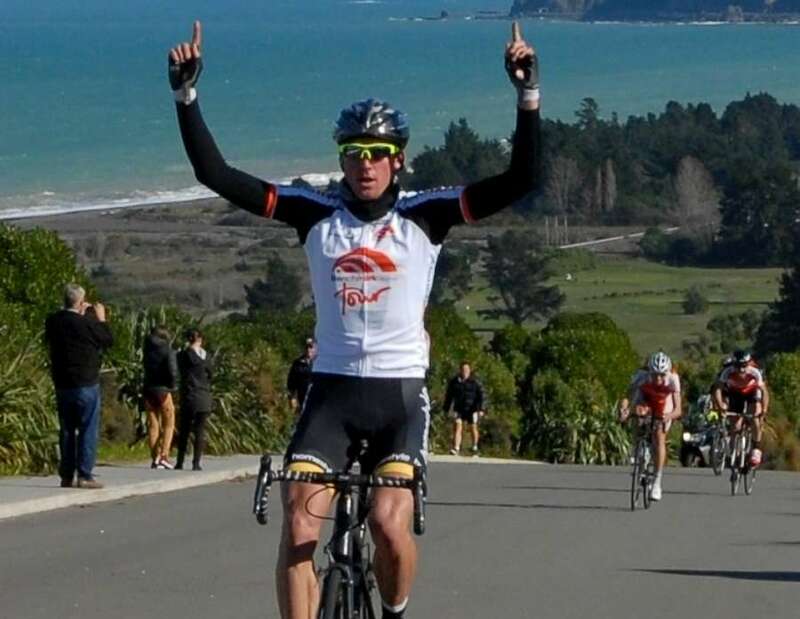 Park, who has also represented New Zealand in Triathlon as well as on the road and track, had a puncture foil a win in the closing stages of the third round of the series from Hanmer Spring to Kaikoura after an impressive solo breakaway. Team Thule Cycling hold a dominant lead in the masters teams classification with Christchurch based teams Velocity and Warmup Cycling in a tight battle for second and third. Thule has a very strong team lining up on Saturday with the previous rounds winner Scott McDonnell, Master’s 3 National trial champion and strong climber Neil Sutherland and experienced sprinter Andre Chappell supporting McFarlane and Stuthridge. Olympic track cyclist Lauren Ellis holds a narrow lead over her Benchmark Homes teammate Sharlotte Lucas heading into Saturday’s women’s racing. Both riders have been consistently placed near the top of the field in every race to date, sharing one win each so far in the series. Sophie Williamson (H & J Smiths) returns to race in the series after a stint in the United States riding for women’s pro team Vanderkitten. After a slow start this year due to injury Williamson had good results that were capped off with a win in round three of the series where she beat Ellis in a tight uphill sprint to the line. Round four winner Hayley Mercer (Benchmark Homes) and Invercargill’s Laura Fairweather (Altherm Window Systems) should also feature. The Benchmark Homes women’s team holds an impressive 36 point lead over the Altherm Window Systems team.